Chelsea manager Maurizio Sarri has said he is happy with his two new signings and confirmed that Eden Hazard will remain a Chelsea player. Speaking at the Huddersfield vs Chelsea pre-match press conference, the former Napoli coach spoke about the Courtois situation and his new goalkeeper Kepa Arrizabalaga. "The Courtois situation was clear. He wanted to go to Madrid. We lost maybe one of the best goalkeepers in the world now, but we bought a young goalkeeper, one of the best young goalkeepers in Europe, so I am really happy. Kepa is very young, he is 23. I hope he can improve very fast." Sarri also said new signing Mateo Kovacic is a very technical player that will be important for his team. "I am very happy to get Kovacic. He has the characteristics for us. He is a very technical player. He is able to play between the lines of the opponent. For us that could be very important", Sarri said. Concerning Hazard, the Chelsea manager said he is sure Hazard will stay at Stamford Bridge despite interests from other clubs in Europe. "Hazard is with us, definitely. It’s not a problem. I have spoken with him three or four times about everything, and he has never said anything about the market, so I think he is very happy to stay here." 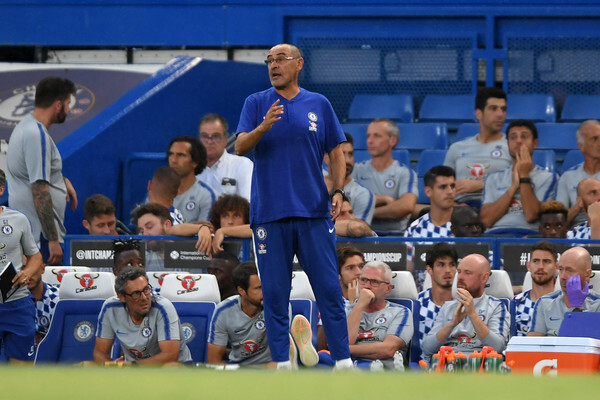 Sarri also pointed out that his team is too large and he prefers to have 23 or 24 players during a football season. The Chelsea boss seems satisfied with his signings saying "Now I think the squad is complete".